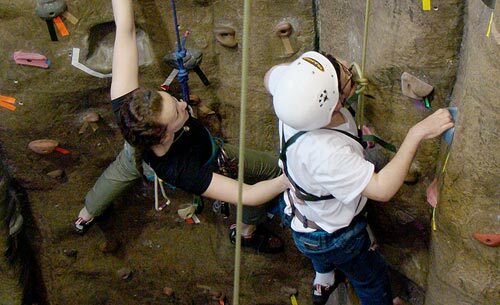 Annalisa Dietz (left) assists Courage Kenny participant Joe Kent as he scales the BWC climbing wall. Annalisa Dietz '17 enrolled at St. Scholastica intending to study physical therapy, but her involvement in the College's Outdoor Pursuit (OP) program uncovered a rewarding new career path. Dietz grew up about two hours south of Duluth in Mendota Heights, Minnesota. When it came time to choose a college, the recreational opportunities of the Northland beckoned. "I remember coming to visit, and getting butterflies coming up over the hill," Dietz said. She immediately got involved in OP trips and programs. 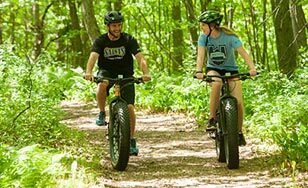 "I went on the Adventure Duluth trip and had amazing guides, and just loved the lifestyle that they had. That's what hooked me right from the start," Dietz said. 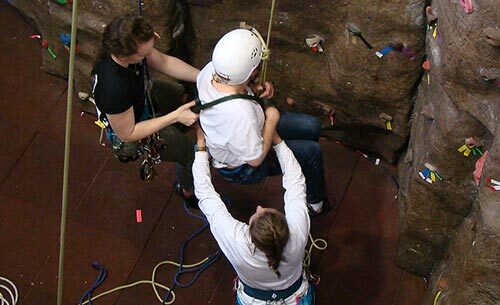 In particular, she fell in love with rock climbing during a trip to Ely's Peak in West Duluth. 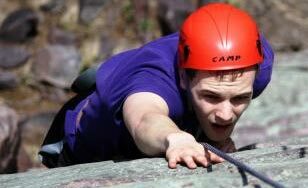 "It was one of the first times I had ever been outdoor rock climbing, and I just absolutely was fascinated by it and loved the appeal of it, the challenge of it." Dietz became a fixture on the indoor rock wall in the Burns Wellness Commons (BWC). 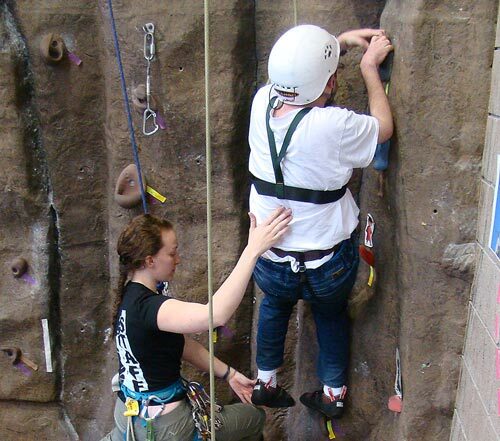 One afternoon, she stopped by for a climbing session to find out that the wall was being used for adaptive rock climbing by the Courage Kenny Rehabilitation Institute. 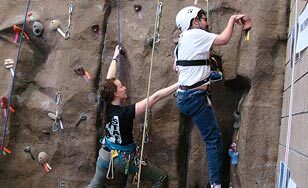 Among the many services it provides to people with disabilities, Courage Kenny offers a suite of adaptive sports and recreation opportunities, from downhill skiing to yoga — and, of course, rock climbing. 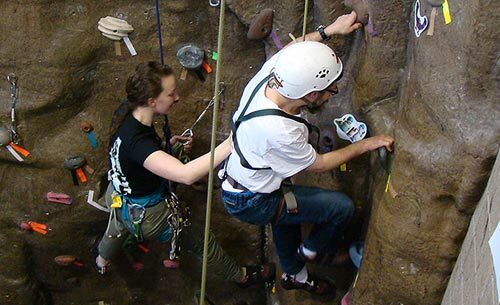 For the past few years, Courage Kenny has partnered with OP to offer rock climbing sessions to its clients, and many St. Scholastica students have volunteered to help out. "I stuck around just to see what it was like, and have been going back ever since," said Dietz, who has since completed an internship with Courage Kenny and switched her major to psychology. After graduation, she'll begin a summer internship with the Adaptive Sports Center in Crested Butte, Colorado. She credits the OP program, especially director Shawn Olesewski, for helping her to discover the perfect career. "I think Shawn and the other employees in Outdoor Pursuit have really pushed me to be who I am," Dietz said. She finds inspiration in the people she works with, and the way they defy barriers to achieve their goals. She recalls an 11-year-old boy with spina bifida who was paralyzed from the waist down. He sized up the intimidating BWC rock wall as she explained his options, which included a special adaptive harness and pulley system for an assisted climb. "He was like, ‘No, I think I'll just give it a shot,'" Dietz recalls. "So we put him in a regular harness, and he climbed the entire wall using only his arms." Above all, she loves sharing in the joy of others as they reach new heights, both figuratively and literally. "You get to help them experience something that they maybe have never experienced before," Dietz said. The people she works with appreciate her devotion. "She's helpful — she knows what she's doing," said Courage Kenny participant Joe Kent after Dietz helped him scale the wall. She climbed by his side, offering gentle guidance while giving him room to succeed on his own. "Annalisa makes sure all participants are physically and emotionally safe, having fun, and working to develop both large motor skills and ‘soft' social skills," said Mark Hanna, Courage Kenny Sports and Recreation Department program coordinator. "Annalisa has ‘the gift' to be able to communicate to others in an open, welcoming, confident, and fun way. It's been an honor to work with Annalisa and the entire Outdoor Pursuit staff team." Olesewski said he's been impressed by Dietz' initiative, follow-through and positive attitude. "Annalisa is not deterred by failure or setbacks; she views those challenging moments as obstacles for growth," he said. "Annalisa's passion for teaching, along with her resilience and approachable demeanor, will lead her to do amazing things in the future." 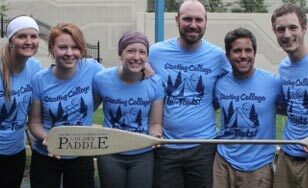 A CSS program dedicated to providing high quality outdoor recreation opportunities to the St. Scholastica community and several partner organizations. Learn more.